Well we haven't had any queries on the Quiz Blog (see blog 9 Sept) so we assume that you all agree that the questions are so easy as to be a real giveaway. The Answer Blog has already been prepared and we reckon that a moderately keen contestant should get 100% correct with about 30 minutes work, maybe an hour with breaks for refreshment. Perhaps it will come down to the tie-breaker? We're still chilling out in Grenada - a really nice place to spend the Summer: nice people, nice island. The weather forecasters have been sufficiently impressed with the Atlantic weather patterns at the moment that they even said that conditions were very UNfavourable for any tropical cyclones. For peak hurricane season in mid-September, this is a pretty good forecast! ... and a photo from the Rum Distillery at St Antoine. This was an interesting guided tour around an ancient distillery. The water wheel was still in use to crush the cane and the whole distillery looked as though it have missed a renovation about a century ago. These are the mash pans - complete with spider webs and goodness knows what. The mash is ladled from one pan to the other as it concentrates at different temperatures. We shuddered to think what a European Food Hygiene inspector would have to say - but after all, it goes into the stills next so any bugs get terminated pretty quickly. The rum is produced at 75% strength, which our careful researches can reveal is pretty warming stuff ...! Last night we went up with some other cruisers to the Fish Fry at Gouyave on the NW coast of Grenada. This is a great family fun event with a great range of different fish dishes for sale in the street stalls. People come from all over the island for this regular Friday event. Fish pizza was very popular and were the fish rissoles. Despite the late evening, we were up early this morning (well, our taxi picked us up at 0900) for the Saturday market in the capital, St George's. There is a market every weekday, but Saturday is bigger with streets closed for extra stalls. 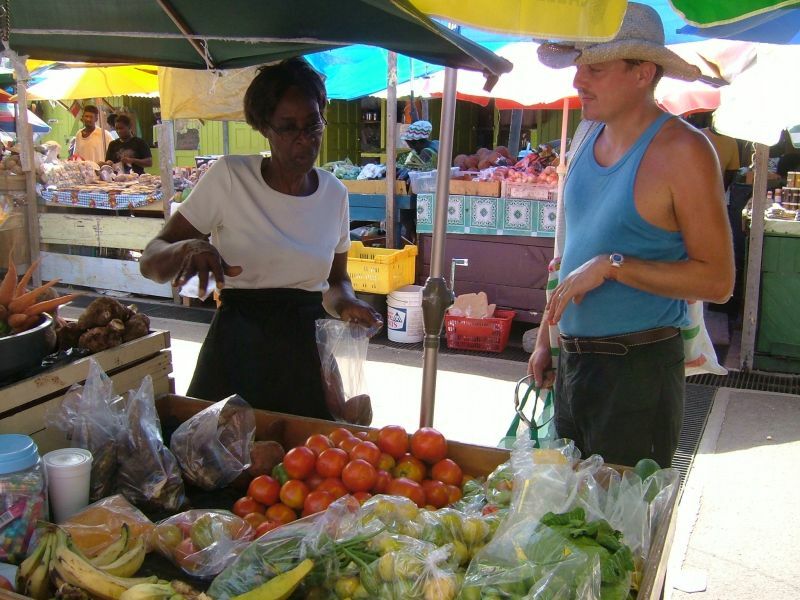 This is a great market and the warm friendly nature of the Grenadian people is much in evidence. 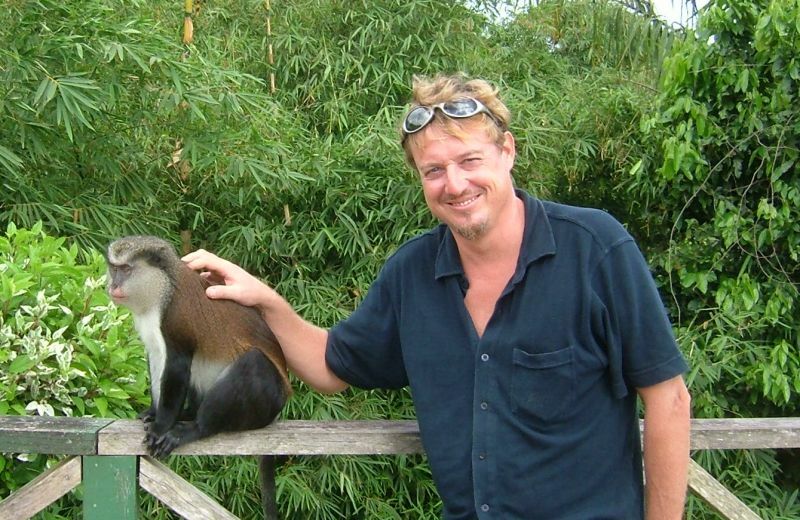 It is an enjoyable and relaxing visit - very little hassle and that, very good natured, which made a delightful contrast to, say, St Lucia, where shopping is hard work. Despite fairly full lockers and fridge, we still managed to buy two large carriers of fruit and veg. Mangoes, for example and excellent quality and only about 7p each - difficult to resist. We also visited the fish market and bought tuna for dinner tonight. We did see turtle for sale - chopped up in portions...maybe next time. Here is George discussing the cooking of sweet potatoes with Mary in the central market. Other news is that we had a fun sail up to Carriacou and back last week - just for a few days for the fun of the sail - you get harbour rot if you sit around at anchor too much. We are also expecting our next visitor - our good friend Jules from Sydney, Oz around the middle of October for a few days. But we are still free most of the time and look forward to welcoming the Quiz winner and friends. And a final thought for the week: there is always strong feeling (in the UK at least) about Hunting with Hounds. Well last week we saw the locals hunting Iguana with hounds - and very successful they were at it too.